iPads are wonderful devices for seniors. You can set them up and they get along just fine. But now Apple has decided to resort to dark UI patterns. Just hit the wrong option and you will find yourself paying for storage you never asked for. And no, there is no option "No, I do not want this". There is just this tiny link "Not now" which means "I will come again until you give up or make a stupid mistake". This is how Facebook operates. Shame on you. Somehow Apple has decided that 5 GB of online storage is plenty for people who just bought a 512 GB iPhone or iPad. Over at Google you get unlimited full res photo and 4K video uploads until the end of January 2022 with each Pixel 3. Not 5 GB, not 500 GB. Unlimited. And you get to keep those uploads even after this 3 year period. No dark UI patterns needed. What do you do about this with a senior's iPad? You install Google Photos and let it backup all photos in 16 MPixel quality. For free. For life. And you instruct the user to never ever trust one of those dialogs and look for the tiny "Not now" link. I agree that the Apple UI is definitely the wrong direction. On the other side though, it should also be kept in mind that even though Google offers unlimited space, there is never such a thing as "for free". Sure we don't have to pay money for it, but what about the privacy? Google is not giving us "free space" just because they are a welfare organisation. Their business model is data, and therefore also the content of our pictures. And to be honest, that's also ok, I don't expect them to give me anything for free. The problem is that not all people are aware of that aspect and one could argue similarly that these are "dark patterns". Ben, your concern is valid. 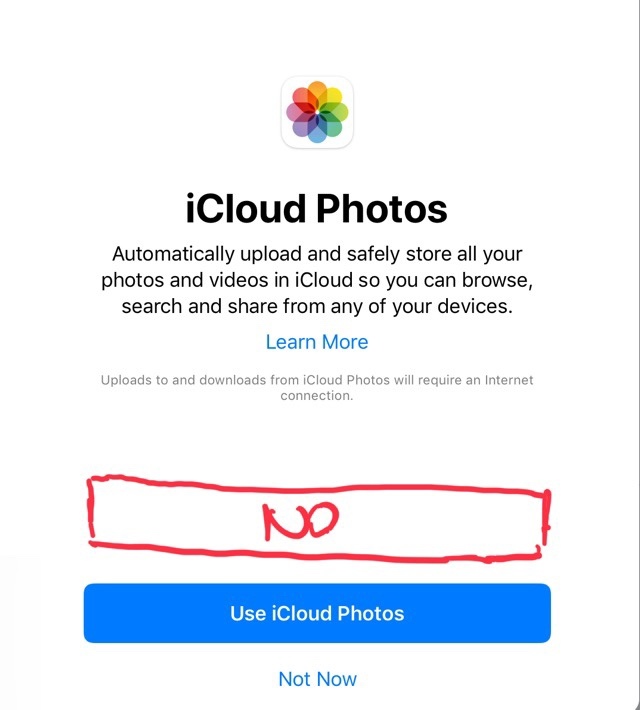 However, Apple is making enough money from the device to provide photo storage. Die 5GB sind echt ein Witz. Es sieht so aus als wenn Apple ihrer "Services"-Einnahmen pushen wollen. Ohne Rücksicht. I am wondering whether it is just a matter of time and financial market pressure until Apple starts to review its commitment on privacy. In the end, we know that a lot of people simply do not care and would relinquish their grandmother for a few bonus points. I suppose Apple does the math on what the opportunity costs and benefits of the privacy strategy are. Right now, it seems to pay off for them as unique selling proposition. It does not imply it will in future.